India detonated five nuclear devices, including a thermonuclear device, during May 11-13, 1998 at Pokhran in Rajasthan desert. Preliminary studies of crater formations at the test site and analysis of seismic signals recorded at seismological observatories world-wide have shown that the total yield of the five detonations was around 60 kT. (BARC Newsletter, No. 172, May 1998). Recently, radiochemical measurements were carried out at BARC on the samples extracted from the thermonuclear test site at Pokhran, and the result of these measurements also proved that the yield of the thermonuclear device was 50 ± 10kT, which is in close proximity to the estimated value of 45kT. In the feature article in this issue, S.B. Manohar et al. discuss some of the procedures adopted for the radiochemical analysis of the samples as well as the calculation of the yield. Organophosphorus metal extractants find wide application in nuclear, base and precious metal industries. Di-2-ethyl-hexyl-phosphoric acid (D2EHPA) is a highly effective metal extractant, commercially used in the hydrometallurgy of cobalt, nickel, copper, zinc, rare earths and transuranic elements. BARC has developed a novel process for synthesising technical grade D2EHPA with a yield of ~ 98% at a relatively low cost. The process was successfully implemented at Heavy Water Plant, Talcher, for industrial scale production of D2EHPA. The five nuclear tests conducted during May 11-13, 1998 at Pokhran in Rajasthan desert included a thermonuclear device, a standard fission device and three small nuclear devices of subkiloton yields (1-3). In the present report, the results of some of the radiochemical measurements carried out at BARC on samples extracted from the thermonuclear test site are reported. Several such fission events occur producing fission products with mass numbers ranging from 80 to 155. 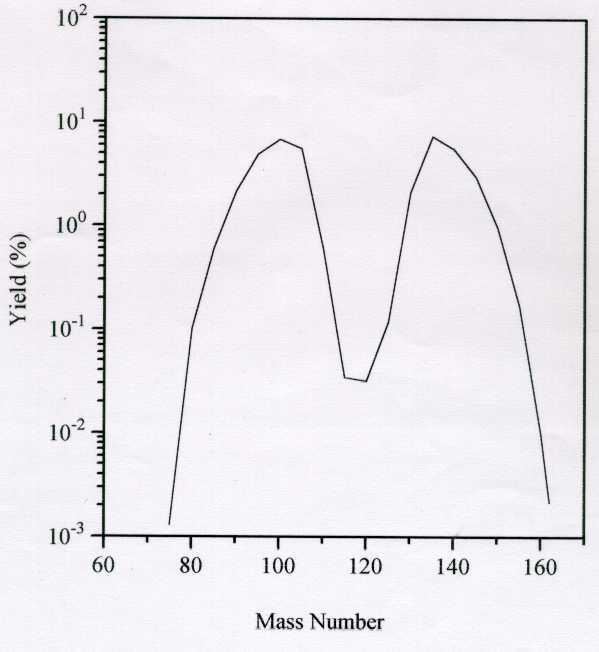 A typical mass yield distribution curve is given in Figure 1. The total energy released in a fission event is about 200MeV. One kiloton ( » 4.18x1019 ergs of primary energy release) of yield corresponds to 1.46x1023 fission, that is, fission of about 57g of the fissile material. Thus, the yield of a fission device can be determined by measurement of the amount of the fission products in the debris. Over the years, the basic studies on mass and charge distribution in nuclear fission have resulted in very reliable data on fission yields (4). Usually the high temperature (108 ° K) needed for such a reaction is achieved by a fission trigger. The thermonuclear device tested at Pokhran used a fusion boosted fission trigger. One kT of fusion yield corresponds to 1.5x1024 reactions which corresponds to fusion of 2.47 moles each of D and T. The number of neutrons produced during fusion is same as the number of fusion reactions and about 4 to 5 times more than that produced in fission reaction to produce the same energy release. The high energy (~14 MeV) neutrons produced in the above fusion reaction induce nuclear reactions of the type (n,2n), (n,p) and (n, ) in the surrounding rock mass and construction materials and thus form the characteristic signature of such an event. 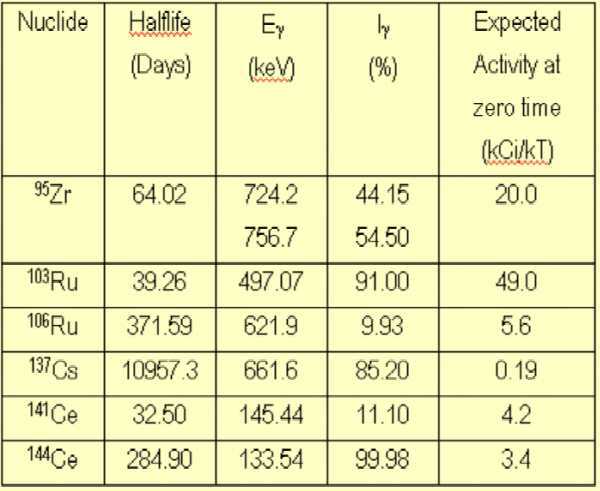 Table 2 gives the relevant nuclear data of 14 MeV neutron activation products measured in the present investigations. measurement of radioactivity in the samples retrieved from this region. Several measurement strategies involving estimation of fission and fusion reactants, different fission and activation products and their daughter products are used to estimate the yield. It is also essential that a large number of samples be analysed to obtain the pattern of the distribution of these activities and, wherever necessary, evolve a method of integration to obtain the overall activity produced since any small sample taken in this puddle can hardly be expected to be a true representative of concentrations which can be related to the yield. What is reported here is one such methodology. The measurements consist of drilling and sampling, radiochemical measurements of radioactivity of fission and activation products and calculation of the yield. Drilling operations at the site of explosion were started within a few weeks of the event. These will be reported separately. 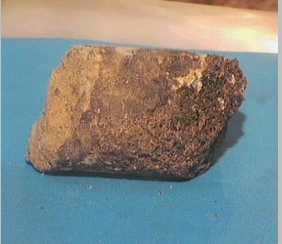 Samples from drilling at the site of thermonuclear test were brought to BARC after initial measurements at the site. Samples from the near surface showed no radioactivity indicating complete containment of radioactivity from the explosion. Some of the samples at lower depths were very active giving gamma dose in the range of several mSv and hence had to be transported in well shielded boxes. In order to take care of the expected inhomogeneity of the rock samples, about 100g of samples were ground to powder with a mesh size of less than 164 micron. 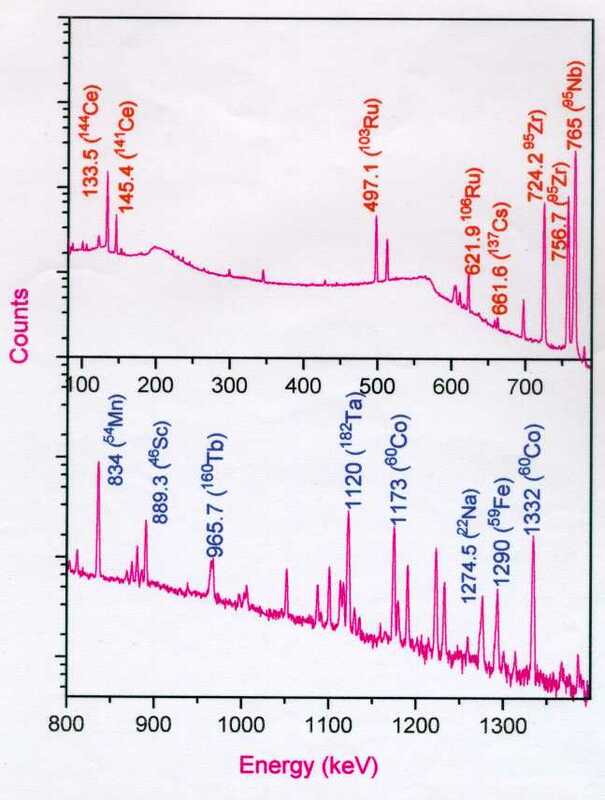 In view of the large variation in the level of radioactivity, three different types of samples were prepared and assayed using high resolution gamma-ray spectrometry. These include (a) 25-30 g samples in a standard counting vial, (b) 100-200mg samples in the form of thin disc source, and (c) dissolution of a known amount of the powdered samples and assay of an aliquot (standard 5ml volume). In order to confirm the noninterference of gamma rays, radiochemical separations on a few selective samples were also carried out for measurement of activity of Zirconium, Cerium and Cobalt. The results obtained by all the four methods were found to agree within the experimental errors (5-7%). T = counting time in seconds. w = weight of the sample in grams. Figure 3 gives the gamma-ray spectrum of a typical sample indicating the gamma-ray peaks due to fission and activation products. The measured radioactivities of fission products were used to arrive at the number of fission per gram of the sample using the appropriate fission yields. 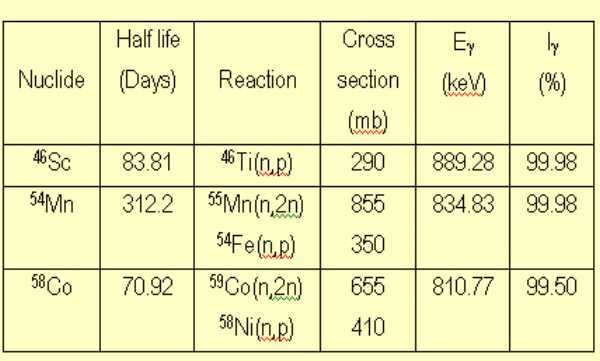 Though the activities were measured for all the fission products listed in Table 1, the fission per gram was obtained from the activity data of 95Zr and 144Ce. These are high yield fission products, are refractory in nature and do not have gaseous precursors which can escape (like 137Cs), or form volatile compounds (like 103,106Ru). The number of fissions/gram (F) as a function of the height for these two nuclides is plotted in Figure 4. Both the nuclides give the identical distribution pattern indicating the overall reliability of the measurements. Figure 4 shows a large variation in number of fissions in the vertical direction. where r is the density of the material. 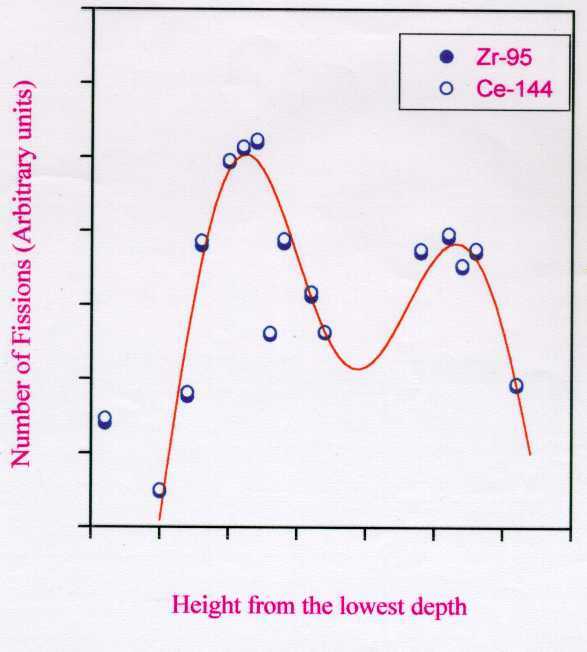 As stated earlier, the signatures of the fusion reaction are activation products due to 14 MeV neutrons, such as, 54Mn, 22Na, 58Co, 46Sc, as marked in the gamma-ray spectrum (Figure 3). The estimation of 14 MeV neutron yield from the measured radioactivity of these products requires the knowledge of the amount of the target elements present at the site of the event and the reaction cross sections. 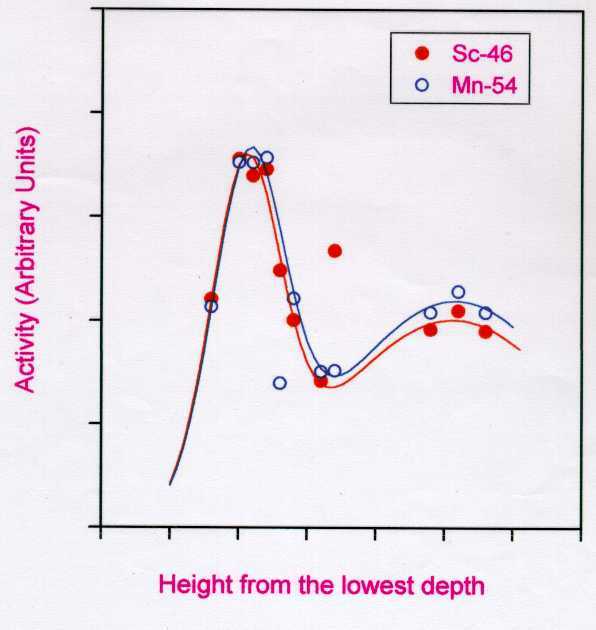 The two major radionuclides which could be assayed in most of the samples were 54Mn and 46Sc. Although the fission neutron spectrum has a high energy tail, the total number of neutrons produced by fusion fraction being much larger, the majority of the high energy neutrons can be attributed to fusion neutrons. Figure 5 shows the profile of the activity of these 14 MeV neutron activation products. The total activity of 46Sc and 54Mn was obtained by integration procedure as that for the fission products. In order to obtain an estimate of the yield of the fusion part of the thermonuclear device, the measured activities of these products were compared with the calculations based on the Monte Carlo simulations (6). The two main factors determining the amount and nature of radioactivity generated in the rock are: i) the chemical composition of the rock, and ii) the number and energy of neutrons escaping from the device. Monte Carlo simulation of the activity of radionuclides formed by reactions, such as (n,p), (n,2n), (n, ), etc., were carried out, with certain assumptions (a) about the number of neutrons escaping from the device, and (b) that the number of neutrons absorbed in any element is proportional to the weighted cross section of all constituent isotopes for both the thermal and fast neutrons. The integrated yield following the methodology described above is estimated to be 50kT. The possible sources of error in the measurement of fission yield are : assay of radioactivity (5-7%); nuclear data such as half life, gamma-ray branching intensity and fission yields (8%); and the error in integration which arises mainly due to the error in Rc (15%). In the assessment of fusion yield, the sources of errors are uncertainty in the elemental composition of the surrounding rock and its effect on the neutron spectrum used in the Monte Carlo simulations of the activity. The propagation of these errors leads to an overall error on the measured yield which is around 20%. Thus it is concluded that the total yield of the thermonuclear device is 50 + 10 kT. Authors wish to express their gratitude to Dr R. Chidambaram for his keen interest and encouragement during this work. The authors acknowledge with thanks the contribution of Dr.S.K.Sikka and Mr. D.S.C.Purushotham in these assessments. The authors would also like to express their thanks to Dr A.V.R. Reddy, Dr A.Ramaswami, Dr A.Goswami, Dr A.G.C.Nair, Mr. S.P.Dange, Mr R.N. Acharya, and other colleagues from Radiochemistry and Fuel Chemistry Divisions who have contributed in these measurements. 1. S.K.Sikka and Anil Kakodkar, BARC Newsletter, No. 172, May 1998. 2. S.K.Sikka, Falguni Roy, G.J.Nair, V.G .Kolvankar and Anil Kakodkar, BARC Newsletter, No. 178, Nov. 1998. 3. S.K.Sikka, Falguni Roy and G.J.Nair, Current Science, 75, 486 (1998). 5. S.S.Rattan and V.K.Madan, BARC Report E-038 (1994).